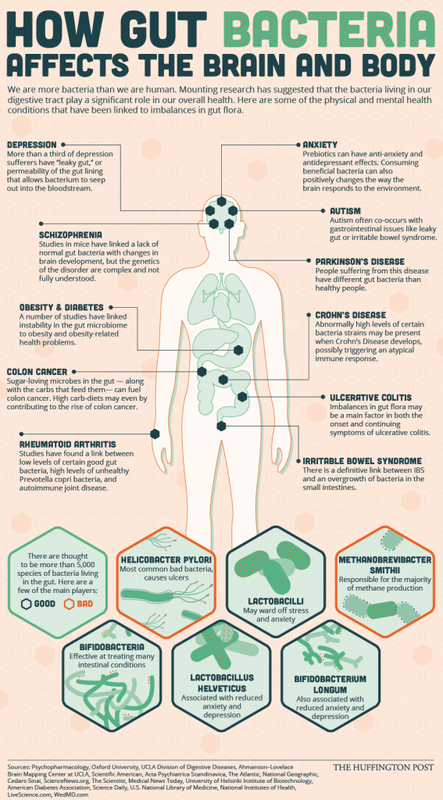 Home Infographic How Gut Bacteria Affects The Brain And Body. How Gut Bacteria Affects The Brain And Body. Scientific research shows that bacteria in our digestive systems affect our brains. 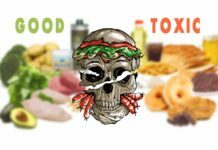 The microbiology in our guts, populated by billions of bacteria, appears to play a significant role not only in our digestive health but also our mental health. Exactly how this happens is still being worked out. But new study turning over another proverbial rock of possibilities. Despite these advances, we don’t yet know how, or if, probiotic supplements can improve our mental health by influencing gut bacteria. The marketing of these products is far ahead of the facts, as a quick review of what we know will show. First, a brief sampling of the latest bacteria-brain research, which includes a study that found specific hormonal exchanges enabling communication between gut bacteria and the brain and how gut bacteria affects the brain. 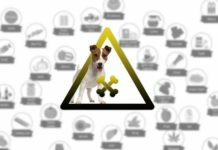 This is especially noteworthy because the hormone in question is cortisol, the so-called “stress hormone”– a well-established indicator of stress levels in humans and other mammals. The implications of this research will take some time to unravel, but one initial takeaway is that our stress-response system may play a key role in how gut bacteria communicate with the brain. Another recent study suggests that gut bacteria may influence anxiety and depression. This study was conducted with mice raised in a sterile, germ-free environment devoid of bacterial influence. Researchers exposed these mice to gut bacteria and watched what happened compared to mice that were raised in a normal, germy environment. 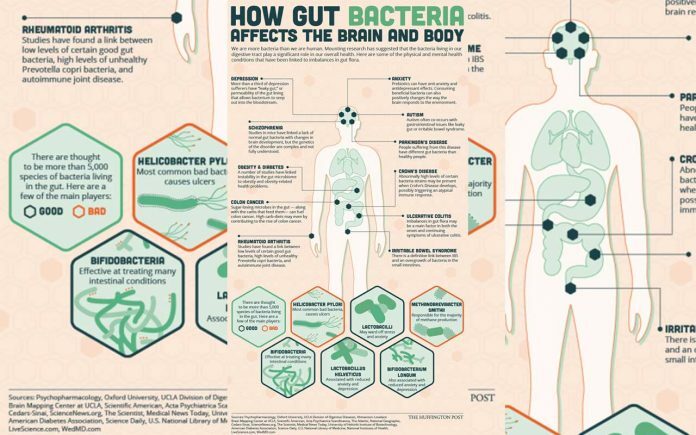 How gut bacteria affects the brain and body. Source: Huffington Post. The germ-free mice exposed to bacteria developed anxiety and depression symptoms on par with the human equivalent. The researchers identified a specific brain region influenced by the bacteria, and suspect that our early-life exposure to bacteria may predispose us one way or another to anxiety and depression later on. Again, the conclusions are speculative, but the research is exciting because it moves us a little closer to figuring out what’s going on. More studies like these are underway and another wave is in the planning phase. So why, with all of this research, can’t we make grand claims for the promise of probiotics? After all, if we have even an inkling that gut bacteria affect our brains (and we certainly have more than an inkling at this point) then why not jump onboard the probiotic supplement express? The probiotic philosophy is to blast the gut with billions of allegedly “good” bacteria, in hopes of populating out the bad ones. While re-populating the gut with good bacteria sounds plausible, there’s little scientific clarity around which gut bacteria are objectively “good” or if that qualification is even valid. Bacteria can be “good” or “bad” depending on a slew of variables. Even less clear is which bacteria influence the brain and how they’re exerting their influence. But let’s say we could achieve perfect clarity on that point, there’s still an enormous gastric obstacle ahead. 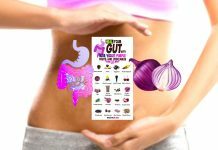 Whether you’re ingesting a probiotic with one billion or 30 billion live bacterial cultures, they still have to survive your stomach acid to do anything worthwhile. Only a couple types of bacteria have proven resistant enough to survive that peril (lactobacillus and bifidobacteria), which means almost everything else in your pricey probiotic capsule is toast. We already know, that gut bacteria affects the brain. But let’s say that the problem is solved by a fantastic pill coating – what will this army of bacteria do once they arrive in your gut? In other words, we don’t know precisely what probiotics are doing in the gut – and there’s at least a possibility that they aren’t doing much to make a difference. Given how little we understand about what probiotics can accomplish in our guts, jumping to a further conclusion that they can improve our mental health is really reaching. 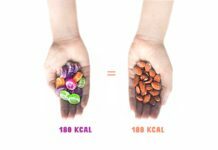 That hasn’t stopped those marketing these products from making outlandish claims, but that’s standard operating procedure for a large chunk of supplement marketing. Where actual science is concerned, we don’t yet know if probiotics can achieve the promises made for them, or what sort of probiotic formula will prove effective. We may eventually find out that probiotics need to be tailored to a given person’s microbiome like bespoke clothing.